Batcave Toy Room - Better Living Through Toy Collecting: How to Build a Life Sized Batmobile Tumbler. How to Build a Life Sized Batmobile Tumbler. It seems most Bat Fans I know prefer the George Barris 1966 version of the Batmobile. But if you love all styles of the Dark Knights crime fighting vehicle or prefer the new Christian Bale version, here's how to put together one for yourself as a display model. 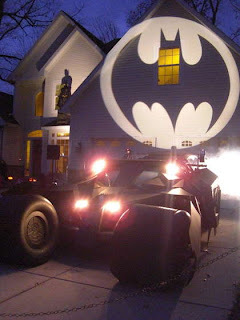 I came across the site Instructables on how to make a life sized Batmobile Tumbler and Batman Themed Halloween Display and thought it was pretty clever. The articles explains it's so simple an average Joe can put it together, which is good for me as you wouldn't know I am my Father's son. I am only handy when I need to be. The author, Jerry Jodloski did it as a Halloween Display last year. It came complete with an animated Batman, a Bat Signal, Batman themed music, Bat sound effects, and his wife Heather dressed as Batgirl. Check it out. It's pretty cool. I wonder if my wife would let me do this for Halloween this year?